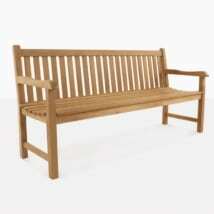 Welcome time honored tradition into your home with the Oxford Teak Bench (4 Seat)! 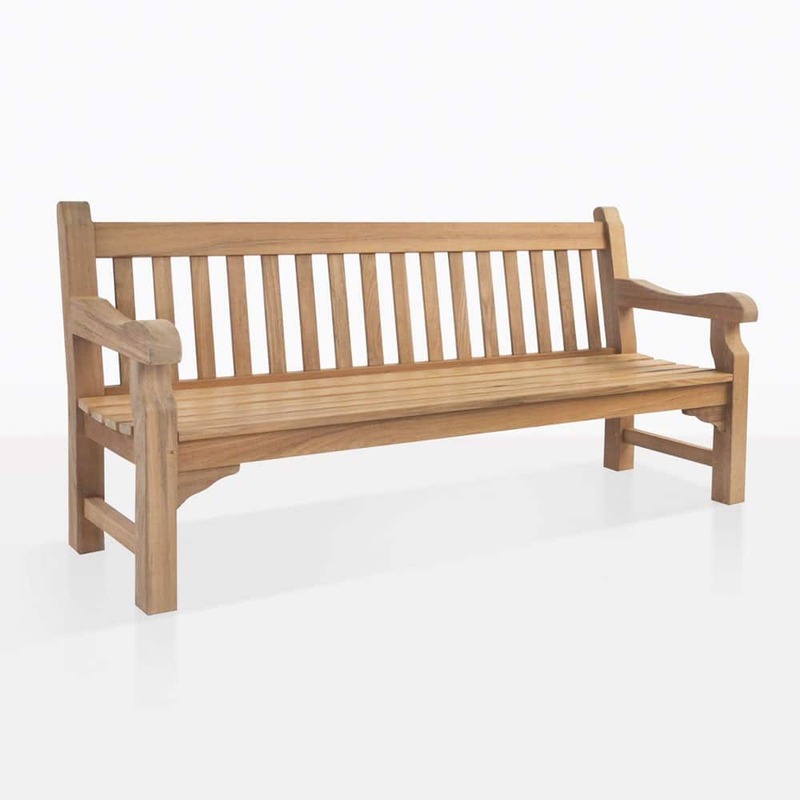 Allow yourself time to relax in the garden under the magnolia tree on this amazing, oversized classic style outdoor Oxford Teak Bench (4 Seat). Perfect for park installations because of the robust size but also a tremendous choice for the garden or patio. 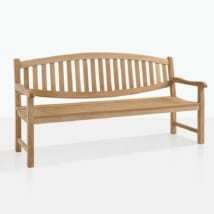 With colossal 3 inch thick teak frame, curved subtly and elegantly on the arms, and held together securely with vertical slats; this Oxford Teak Bench (4 Seat) defies expectations! A-Grade Teak has long been a favorite at Teak Warehouse – we have been making furniture out of this impeccable wood for over 20 years – and why not?! It has proven year after year that it creates amazing wood that lasts a lifetime. 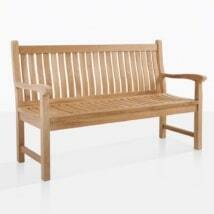 L71" x D26" x H36"
A-Grade teak is the heartwood of the best sustainable teak trees. We use timber that is cut from tress that are harvested when the Teak Tree (Tectona Grandis) reaches a certain age and/or height (usually 40 years.) This is because the plant has had enough time to generate rubber and oil throughout, giving it a luxurious appearance and extra strength so it may be part of the fabric of your environment for years to come. Pair up your Oxford Teak Bench (4 Seat) with many of our other products to customize to your space – perhaps your space is more contemporary? Place two of the Oxford Teak Bench (4 Seat) opposite each other with a Large Raw Concrete Coffee Table in between for a fabulous, heavy-duty look. At Teak Warehouse, we have everything you need to make your space bountiful! Choose from #316 Stainless Steel, Reclaimed Teak, Batyline® and Textilene® mesh, Aluminium, Sunbrella® and several kinds of All Weather Wicker – we have the perfect collection of items for inside as well as out! Whether your pool is in need of some loungers, tables and shading, or your patio is craving some relaxing seating, or perhaps you wish to deck your deck out in a lavish dining set, we guarantee we have something for everyone! Try setting up the Oxford Teak Bench (4 Seat) near your dining set and placing one of our large 13 foot Cantilever Umbrellas in between, so you may rotate it over to your bench when you need to relax after a large lunch! 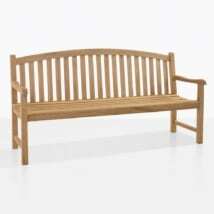 This Oxford Teak Bench (4 Seat) is an ideal bench for park seating, lined up spaciously along a walkway, or overlooking a lake. This is a piece that exemplifies traditional values in its secure, robust frame. We also love the Oxford Teak Bench (4 Seat) in the residential garden, surrounded by gorgeous flowers, herbs and lush greenery – create your own tranquil space now with this lovely, long bench! Grown by nature, fashioned by craftsman; the Oxford Teak Bench (4 Seat), is made with A-Grade Teak and put together with marine grade glues and fittings by the experts! This is a bench that not only looks beautiful now, but will do so for years upon years to come! 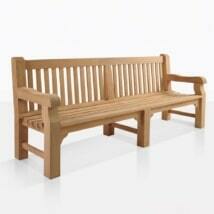 The Oxford Outdoor Teak Bench seats 4 to 5 people comfortably and is available now! Call in or call up today to order yours!